A circular route starting at the Ardgartan Visitor Centre. 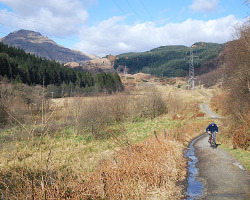 Follow blue waymarkers down to the shore, then climb back up to Coilessan Glen crossing the Red Cycle Route, back to the Coillessan Events Carpark, and then back to Ardgartan Visitor Centre. 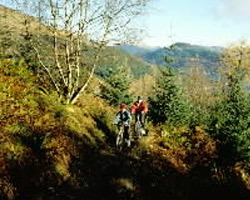 Ardgartan Shore Cycle Route can be started from Ardgartan Visitor Centre in Ardgartan which is part of Argyll Forest Park. The B8000 is a quiet single track road that meanders along the Lochside. It is great for exploring by bicycle. The estate and the surrounding area provide 'mile upon mile' of unspoilt forestry commission tracks and forest paths.